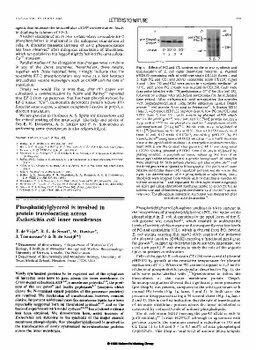 RePub, Erasmus University Repository: Phosphatidylglycerol is involved in protein translocation across Escherichia coli inner membranes. Phosphatidylglycerol is involved in protein translocation across Escherichia coli inner membranes. Newly synthesized proteins to be exported out of the cytoplasm of bacterial cells have to pass across the inner membrane. In Gram-negative bacteria ATP, a membrane potential, the products of the sec genes and leader peptidases (enzymes which cleave the N-terminal signal peptides of the precursor proteins) are required. The mechanism of translocation, however, remains elusive. Important additional roles for membrane lipids have been repeatedly suggested both on theoretical grounds and on the basis of experiments with model systems but no direct evidence had been obtained. We demonstrate here, using mutants of Escherichia coli defective in the synthesis of the major anionic membrane phospholipids, that phosphatidylglycerol is involved in the translocation of newly synthesized outer-membrane proteins across the inner membrane. AD	- Department of Biochemistry, University of Utrecht, The Netherlands.